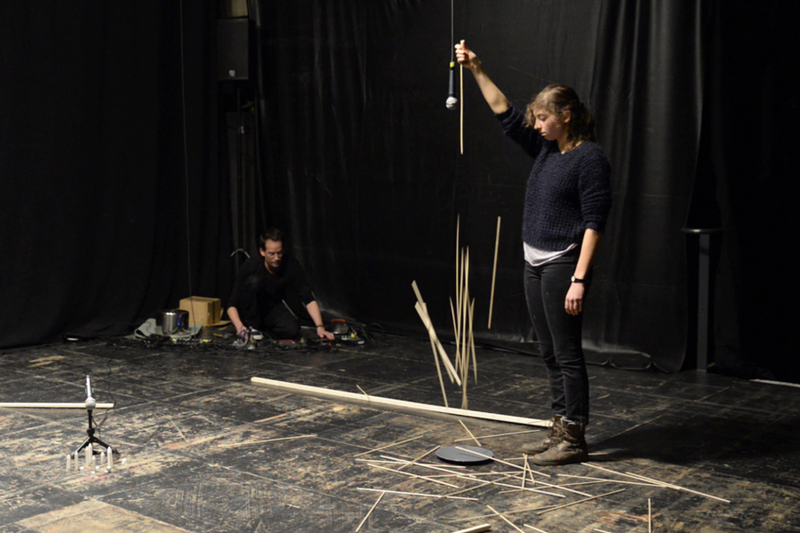 Till and Anaïs presented their work at Shifts/Investigating Scores in Performance Art at Meinblau Projektraum for Month of Performance Art 2015. 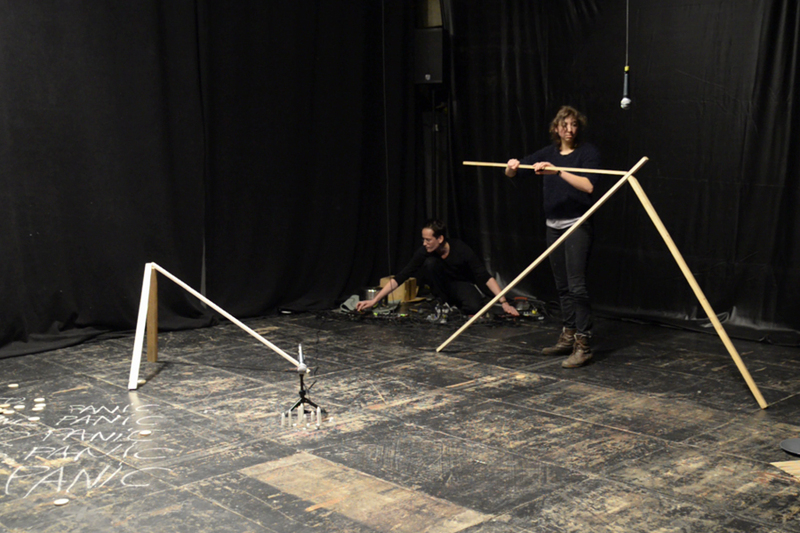 Their piece used multiple simultaneous structures, building systems of relation between objects, words and the sounds. 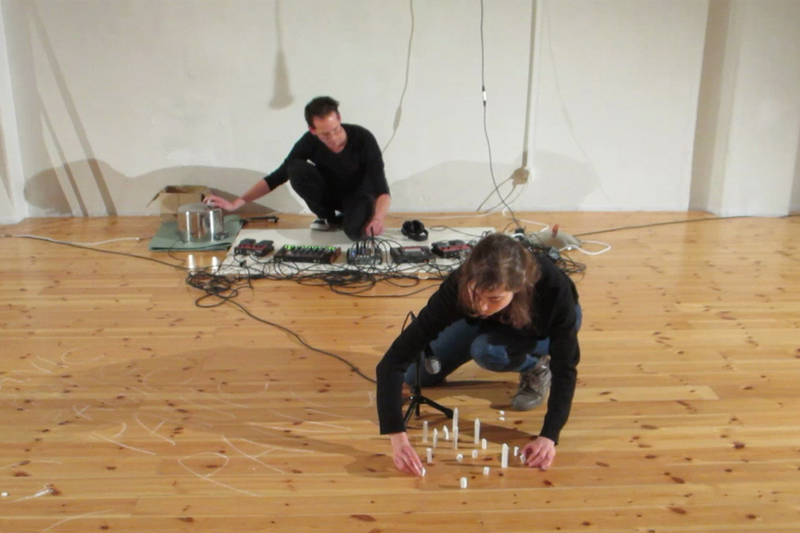 Visual rhythms were established in the space that were also physical structures (pieces of chalk and wood) that related to sonic layers produced by looped recordings of actions. The use of language seemed to frame the actions as words were written repeatedly throughout the space. Johanna: I’ve had the opportunity to speak with several of the other artists in the event, Everyone seemed to have a different take on what they were considering to be scores and how they were using them. I was wondering if you would be willing to speak about the way that these structures (or scores) were developed and how they affect each other within the piece. 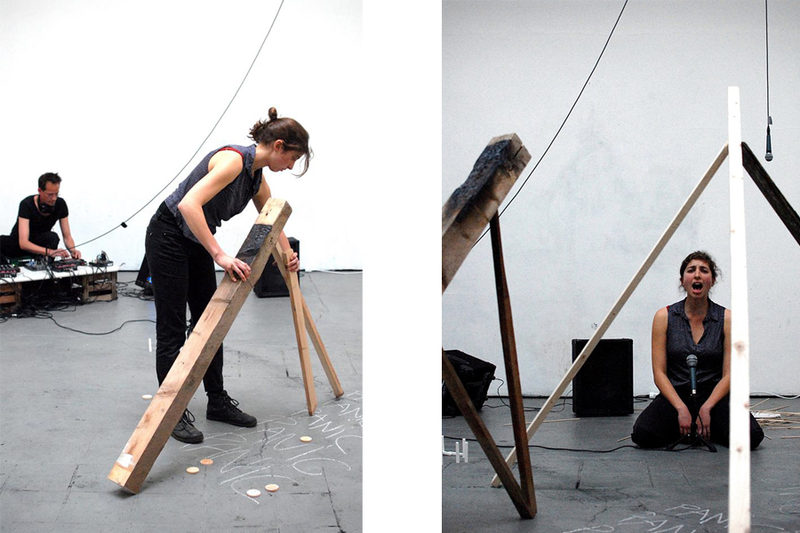 Anaïs: We developed this work during a residency in Saari/Finland earlier this year. We had one weeks time and we wanted the process of the whole week of creation to be visible in the performance. During this residency, I have been working on the concept of Ritournelle. I don’t know how to translate it in English but it’s something like Refrain, even though that word doesn’t fully define what it means. It’s a kind of song that kids sing and that turns over itself…the first word becomes the last word and the last word becomes the first word. 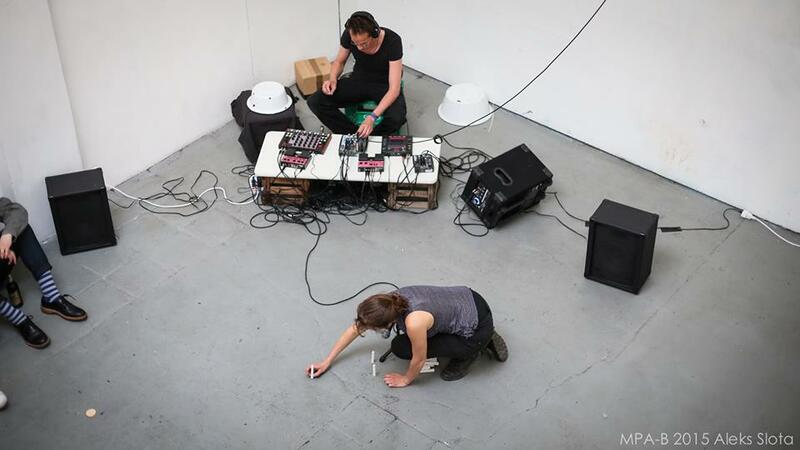 It is a musical concept and a theoretical concept, - Deleuze and Guattari talk about it in 1000 Plateaux – which is also a performative concept. It’s not about creating a story where you go from the beginning to the end. It’s more circular which means that as a singer you are activating the situation. This concept interests us a lot. We wanted to use this to think about how to write a score for a performance. We didn’t want to write it from the beginning to the end because part of what interests us in performance is that you just let the situation happen. We wanted to write a score for a performance that has a circular and repetitive nature so that it is more close to the reality of the action. Till: Because the Ritournelle is often connecting repetitive texts with melodies and rhythm I was curious to investigate the way that the concept has a sonic equivalent in loops, which are of course circular as well. They have something Ritournelle-like about them. This is the investigation process that we are in: how to apply the concept of Ritournelle to image but also to sound. Working with loops allows us to continue with sounds that come up from movements, from actions and from images. A: So to answer your question, we didn’t develop the two separately. Everything was responding to each other…like, oh, this action makes this sound; how can we answer to it? And the words appeared as a common starting point. The whole process was then like a ping pong game. T: This work is based on a collaboration that we started about two years ago. We used different elements: movement, text, image, sound etc., but I think using the Ritournelle has allowed the most contact or interaction between the different elements. A: The concept of Ritournelle made it fluent. It brought it together because it wasn’t two different things anymore. Image and sound were all together. We found a good conceptual platform to develop this throughout the process. J: So this idea of cycling…it seems like it might be difficult to find a natural ending point. Was that true? A: This could be true if a Ritournelle was only circular, but the idea is that it is also a progressive space. The words Panic, Twisting and Growing, Rain and Deny, all with their own rhythms and characteristics, helped us to create clear steps for the performance. T: In the beginning of the process we had a lot of words. Then we reduced and focused more and more and in the end we had these words. Every word was a starting point for some kind of image and sound action. J: So the words were a starting point then…the other things came from the words? J: I felt compelled to use the word Structure rather than Score when describing your performance. Would you say that’s an appropriate word to use? To you is the word structure interchangeable with the word score? A: What I like about the word score is that you can use it also with music. It is not the word script or instruction. Score for me is more open to imagination. Because in the idea of score you already have the idea of interpretation. At least in music. You interpret the notes. Ok, so you know about time, you know about melody…but then the way you will put your own presence and your own perception into it is open. This is often how people are touched by the interpretation of a musician for example: because you perceive something of her/him at this specific moment and you follow her/him in his doing. This is important for us, and structure seems more of a closed space. J: My last question is about your collaboration. Because your performance reflects your process so much I was wondering about the ways that you make decisions together within the work. Have you developed a system for a collaborative decision-making process or has this process become totally intuitive? T: Maybe just to frame it a bit more I should say that the collaboration is not the only work that we do. It is an important part of our work but we also do solo work and also collaborate with other artists. I myself collaborate with other artists in theatre work. But this collaboration that we have developed in the last two years is really special because we do what we described before: we investigate the connection between sound, image and word. We come from, maybe I should say different directions artistically, so the collaboration is always some sort of complimentary interaction. It is very dialogical, I would say. In the process of investigating the performance there is always some kind of dialogue between the way that Anaïs works and the way that I work. From this dialogue we are developing a new way of working. So to get back to your question, I think that the process itself is quite intuitive. We try out a lot of different things and then we reflect on them. We think about what we did like and what we didn’t like. We make recordings and we listen to them, but also then it continues to be intuitive. Also the live performance is a kind of intuitive dialogue between image, sound and word even though we have a roughly set order for what will happen. A: I think the fact that we are not just collaborating in art but also have other things that we are doing together is important. The performance itself is a nice way to develop a language. We each have our own individuality but then we find each other. It is not as if we are one entity. We have two imaginations, two different worlds, but then the worlds cross and come together. It’s a language that we build to communicate with the audience but it’s also a language that we build to communicate with each other. This makes it exciting to go further with the collaboration. How does it develop with our new experiences and our lives? It’s always becoming more clear. T: I would like to add a bit more about the character of our investigation from my point of view, as someone who works a lot with sound. I have seen many performances that I found impressive in their visual aspects, in the way that the works remain as installations or paintings. I find this very fascinating. What we are trying to do is to translate this idea into sound. In a way the set-up that we have with the loop machines and effects allows us to make the sonic aspects reflect the traces left by the installation. 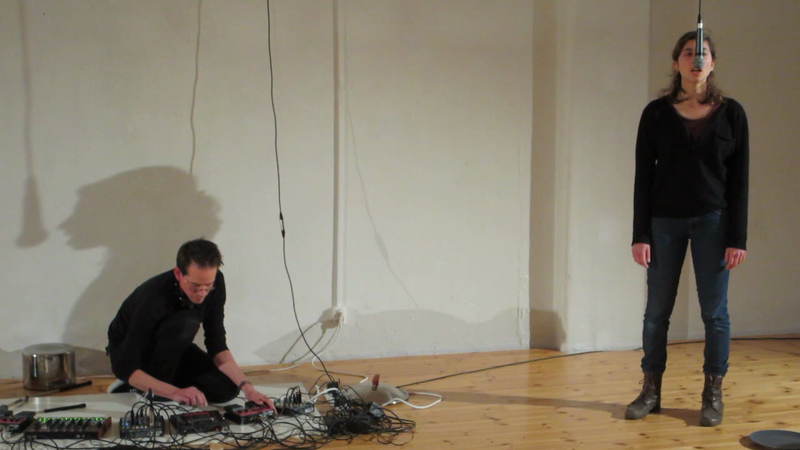 We try to translate what happens in the performance in visual terms into the acoustic qualities. J: Does that mean that the sound is an interpretation of the image or vice versa or is it more that they just trigger one another? T: I wouldn’t say the sounds are interpretations. What happens a lot in the performance is that the actions themselves create the sounds. The sounds are then looped and worked on, including the voice of Anaïs. Then the sounds are translated into action again, and back again etc. It is very dialogical. The technical set-up allows the sound to remain. For example, when one piece of wood falls on the ground it happens and then it is over, sound- wise, but if we loop the sound we can continue to work with it. A: It has something of a trace, the trace of what has happened. I am fascinated with that in performance art. Maybe you do an action that you can only do once because maybe you destroy something in the action and then the trace of it is left. We are trying to work with the sonic trace in relation to the trace of the action. It is an imprint as well. T: Yes, where does the action create sounds that are looped and how do these looped sounds influence the action again? You said ping pong, no? It’s about this kind of interaction. Only that we have several ping pong balls in the game. J: Thank you both so much!